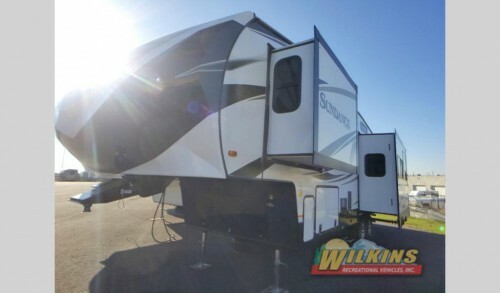 We love being a Sundance and Sundance XLT dealer because this type of RV comes in many different styles to make sure that you get the exact type that you want. With both travel trailer and fifth wheel options, you are sure to find what you need to fit your style and your family for your next RVing vacation. Get amazing amenities in the lightweight Sundance XLT Travel Trailers! 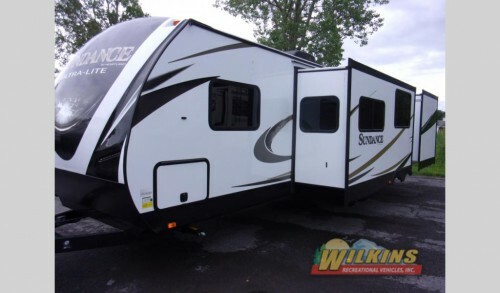 Take a look at the Sundance XLT travel trailer for example. This option comes with features inside, such as the double door refrigerator and built-in 12V and USB charging stations, and out, like the LED-lit pass-thru storage compartment and electric awning with speakers and LED lightstrip. Plus, you will find all of these things and more in an ultra lightweight package that is perfectly designed to be pulled by lighter trucks and even the more fuel efficient crossovers! Towing one of these campers will be easy on your vehicle and easy on your wallet. The fifth wheel models will feature both Sundance and XLT options. These floorplans will offer a little higher end features like a premier kitchen complete with solid surface countertops and a stainless steel fridge. Throughout the interior, you’ll find amazing upgrades that add luxury like the porcelain toilet, 55” TV in the living room, and the washer and dryer prep area in the master bedroom. Find even more luxury in the Sundance and Sundance XLT Fifth Wheels! And be sure not to forget the optional additions you have on these Sundance fifth wheels. Add a fireplace, living room fan, theater seating, a second air conditioner in the bedroom, and much more to truly make it the RV of your dreams. With all of the different Sundance and Sundance XLT models you can get, there is certain to be one that fits all of your needs. Contact us to find out more about these and any of the other travel trailers and fifth wheels we have, and then, be sure to stop by any of our locations to take one home today!